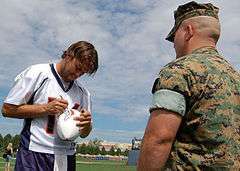 Jake Plummer visits Luke Air Force Base, Arizona in 1998. Jason Steven "Jake" Plummer (born December 19, 1974) is a former professional football player, a quarterback for ten seasons in the National Football League (NFL). He was selected by the Arizona Cardinals in the second round of the 1997 NFL Draft, and spent his first six seasons with the Cardinals and the last four with the Denver Broncos. Plummer played college football at Arizona State University. His nickname, "Jake the Snake," was given to him as a tribute to professional wrestler, Jake "the Snake" Roberts. Coincidentally, Roberts adopted that nickname as a tribute to his favorite NFL player, former Oakland Raiders quarterback Ken Stabler, who was nicknamed "Snake." Plummer joined the Pac-12 Network in 2013 as a studio analyst for college football. Born and raised in Boise, Idaho, Plummer attended Pierce Park Elementary, Hillside Junior High, and graduated from Capital High School in 1993. He was a three-sport star in high school, playing baseball and basketball in addition to football. Plummer was selected all-state as both a quarterback and punter and passed for 6,097 yards and 68 touchdowns in his junior and senior years. Plummer accepted a football scholarship to Arizona State and during his senior season, he led ASU to an undefeated regular season, a Pac-10 championship, and the Rose Bowl where the team lost to Ohio State 20–17. Had they beaten Ohio State, they would have likely won at least a share of the national championship, since they would have been the only undefeated team in the nation. That March, he was selected in the second round of the 1997 NFL Draft by the Arizona Cardinals, the 42nd overall pick. For his college career he threw for 8,626 yards with 65 touchdowns and 34 interceptions. Plummer split time with both Kent Graham and Stoney Case during his rookie season, playing in 10 games and going 3–6 as a starter, as the Cardinals went 4–12 to finish 4th in the NFC West. In 1998, Plummer started all 16 games and led the Cardinals to a 9–7 regular season record and an upset victory against the Dallas Cowboys in the playoffs – giving the Cardinals their first postseason victory since 1947. However, Plummer had a disappointing season in 1999 as he went 3–8 as a starter, only threw 9 touchdowns as opposed to 24 interceptions, and the Cardinals finished 6–10. Regarding Plummer's season, the Football Outsiders commented: "At the start of the 1999 season, Jake Plummer was being celebrated as one of the NFL's best young quarterbacks, the man who would make the Cardinals respectable again. By the end of the 1999 season, Plummer ranked as the league's worst quarterback." In 2000 Plummer threw for 2,946 yards, 21 interceptions, and had a 66.0 quarterback rating. Although he reached 10,000 career passing yards (in 47 starts), Plummer compiled a 3–11 record and the Cardinals finished 3–13, in last place in the NFC West. Plummer bounced back in 2001 with his best statistical season with the Cardinals. He was one of only two NFL quarterbacks to take every snap for his team (Kerry Collins was the other), and he passed for 3,653 yards, 18 touchdowns, and 14 interceptions. During the season, he had a stretch of 142 consecutive pass attempts without throwing an interception. Plummer also led the NFL in fourth-quarter passing yards (1,227) and the Cardinals to a 7–9 record, and a 4th place in the NFC West. Plummer's last season with the Cardinals was 2002 and again his statistics were below league average (65.7 passer rating, 2,972 yards, 18 touchdowns and 20 interceptions). On September 22, he eclipsed 15,000 career passing yards against the San Diego Chargers. Plummer signs a football at Broncos training camp in 2006. After spending the first decade of his adult life in the Valley of the Sun, Plummer signed as a free agent with the Denver Broncos in 2003, replacing Brian Griese. With guidance from Broncos head coach, Mike Shanahan, Plummer finished with a career high 91.2 quarterback rating. On September 22, he had the longest run by a Broncos QB on Monday Night Football, a 40-yard scramble in a 31–10 win over the Oakland Raiders. He led the Broncos to a wild card playoff berth, where the Broncos were beaten by the Indianapolis Colts 41–10 at the RCA Dome. In 2004 he matched or surpassed several of Broncos Hall of Fame QB John Elway's passing records (including passing yardage and passing touchdowns in a single season). However, continuing a career-long shortcoming, he also led the league with 20 interceptions (as he finished his career with both 161 touchdowns and 161 interceptions). He led the Broncos to a second straight wild card playoff berth, but the Broncos were again beaten by the Colts, 49–24. In 2005 Plummer experienced arguably his best season as a professional. Most notable was his streak of 229 passes without an interception, the longest such streak of his career. Along the way, Plummer helped the Broncos compile a 13–3 record and a #2 seed and a first round bye in the AFC playoffs (behind the Colts). The Broncos' first game was against the New England Patriots in the AFC Divisional Game at Invesco Field. Although not outstanding, Plummer's performance (15–26 for 197 yards, 1 touchdown, 1 interception) helped the Broncos to break the Patriots' winning streak of 11 postseason games and guided them to their first postseason victory since Super Bowl XXXIII. However, Plummer accounted for four turnovers in the AFC Championship game and the Broncos were defeated 34–17 by the eventual Super Bowl champion Pittsburgh Steelers. On November 27, 2006, after a lackluster performance in the first eleven games, and following back-to-back losses to the San Diego Chargers and Kansas City Chiefs, head coach Mike Shanahan announced that Plummer would be replaced at starting quarterback by rookie Jay Cutler. The decision to hand a 7–4 team over to a rookie quarterback was met by fans and media with mixed reactions. Those who viewed Plummer as inconsistent heralded the change as one that would revive the Broncos' struggling offense; others claimed such a move was ill-advised, especially given that Plummer had guided the Broncos to the AFC Championship game the year before; Plummer had also been 40–18 with Denver in both regular season and playoff games, while leading his teams to 30 game-tying/winning drives in his career, a league high. In Denver's first game of the season with Cutler starting, a 23–20 overtime loss to the Seattle Seahawks, Plummer served as holder. On March 3, 2007, Plummer was traded to the Tampa Bay Buccaneers for a 2008 conditional draft pick. However, rumors began to surface that Plummer was going to choose retirement over competition with the Buccaneers' four other quarterbacks on the roster (Bruce Gradkowski, Tim Rattay, Jeff Garcia, and Luke McCown). On March 9, Plummer ended the speculation by announcing his decision to retire. Plummer also confirmed his retirement through the Jake Plummer Foundation's website. Since he was still under contract to the Buccaneers and had already been given his contract signing bonus, Tampa Bay coach Jon Gruden met with Plummer in July to try to convince him to reconsider and report for training camp. However, the attempt was unsuccessful and the team sued for recovery of the bonus. A settlement was finally reached on June 10, 2008 in which Plummer was required to pay back $3.5 million to the Buccaneers. Since his retirement from the NFL, Plummer has been an avid player of four-wall handball. He attended his first professional handball tournament in 2007 when he entered the Simple Green US Open of Handball (with brother Eric) in the pro doubles division where the pair lost to future Hall of Fame members John Bike and Danny Bell. In 2008, Plummer hosted his own pro invitational and lost in the finals of the pro consolation bracket to #37 ranked, Jeff Kastner. Also in 2008, Plummer lost in the semifinals of the 2008's Idaho State Singles Championships to his brother (the eventual champion). On March 23, 1997, Plummer was accused of fondling three women at the Tempe, Arizona night club, Club Rio. The women stated to police that Plummer reached under their skirts and down their pants while dancing with them and consuming alcohol. When one of the women objected, he allegedly kicked her in the leg. Plummer was formally charged on May 28, 1997, with felony sexual abuse. He later struck a plea bargain, received two years probation, was also fined $1,020, and ordered to perform 100 hours of community service. Plummer married former Broncos cheerleader Kollette Klassen on August 26, 2007. The two met in 2005 and now reside in Boulder, Colorado. In September 2007, Plummer was inducted into the Arizona State Hall of Fame. Later that year, he made a brief appearance in the 2007 Holiday Bowl, when he introduced the ASU players prior to the team playing game. On October 29, 2010, Plummer was honored, along with all Sun Devil Quarterbacks, at a Legends Luncheon hosted by the Arizona State University Alumni Association and Sun Devil Club. Other honorees included Danny White, Andrew Walter, John F. Goodman, and Jeff Van Raaphorst. In June 2010, Kollette gave birth to the couple's first child. Plummer has been an assistant football coach at Sandpoint High School since 2009. Plummer has come out in support of medical marijuana and has stated that he uses it regularly to deal with lingering post-football injuries. Plummer was a teammate with safety Pat Tillman, at both Arizona State and the Arizona Cardinals, and the two became close friends. 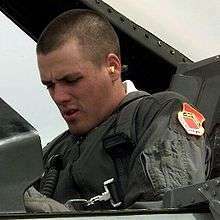 After the 2001 season, while Plummer was still with the Cardinals, Tillman joined the U.S. Army Rangers in response to 9/11. Following Tillman's death in Afghanistan on April 22, 2004, all NFL players wore a memorial decal on their helmets on September 24 in honor of Tillman and the Cardinals continued to wear this decal throughout the 2004 season. Plummer, who by this point was with the Broncos, also requested to wear the decal for the entire season, but the NFL turned him down because his helmet would not be uniform with the rest of his team. For the 2005 season Plummer grew an untrimmed, full beard and wore his hair long in honor of Tillman, who had worn such a style in the NFL before cutting his hair and shaving off his beard to fit military uniform guidelines. ↑ "Former Arizona State quarterback Jake Plummer joins Pac-12 Networks". Pac-12 Conference. August 28, 2013. Retrieved September 8, 2013. ↑ Raffel, John. "Player Spotlight: Jake Plummer". Retrieved 2008-12-15. ↑ "Jake Plummer College & Pro Football Statistics - Totalfootballstats.com". totalfootballstats.com. ↑ "Arizona Cardinals Playoff History". Pro-Football-Reference.com. ↑ "FOOTBALL OUTSIDERS: Innovative Statistics, Intelligent Analysis - 1999 DVOA Ratings and Commentary". footballoutsiders.com. ↑ "Oakland Raiders at Denver Broncos - September 22nd, 2003 - Pro-Football-Reference.com". Pro-Football-Reference.com. ↑ Mason, Andrew (2006-11-27). "Cutler to Start". DenverBroncos.com. Retrieved 2006-11-29. 1 2 3 4 5 6 Ballard, Chris (February 14, 2011). "What Was He Thinking? : You have to wonder why a red-blooded American male in his prime would walk away from fame and fortune as an NFL quarterback to play handball and hang with his family and his dogs. Don't you?". Sports Illustrated. Time Inc. Retrieved 2011-02-11. ↑ Klis, Mike (2006-11-26). "Start the Cutler era". denverpost.com. Retrieved 2008-08-23. ↑ Bill Williamson (2007-03-02). "Plummer refuses to take trade". DenverPost.com. Retrieved 2007-03-02. ↑ Klis, Mike (March 3, 2007). "Plummer: I'm really retiring". DenverPost.com. Retrieved March 13, 2015. ↑ Jim Flynn (2007-07-26). "Bucs News & Notes July 26, 2007". PewterReport.com. Archived from the original on 2007-09-27. Retrieved 2007-07-26. ↑ Klis, Mike (June 10, 2008). "Plummer, Bucs reach settlement". Denver Post. ↑ Hammond, Rich (2007-10-19). "Plummer's handball odyssey". denverpost.com. Retrieved 2007-10-22. ↑ Clemmons, Anna Katherine (2008-11-17). "Where in the world is Jake Plummer? Playing handball". espn.com. Retrieved 2008-11-17. ↑ "News". ASU Alumni Association. ↑ "Jake Plummer coaching at Sandpoint High". Sports Illustrated.com. Associated Press. April 17, 2009. ↑ Cook, Brandon (December 8, 2014). "A Personal Look At Marijuana Policy". Whaxy. Retrieved March 13, 2015. ↑ Jake Plummer Career Stats. TotalFootballStats. Retrieved 2013-03-19. ↑ Jake Plummer NFL Profile. NFL.com. Retrieved 2013-03-19. Wikimedia Commons has media related to Jake Plummer.